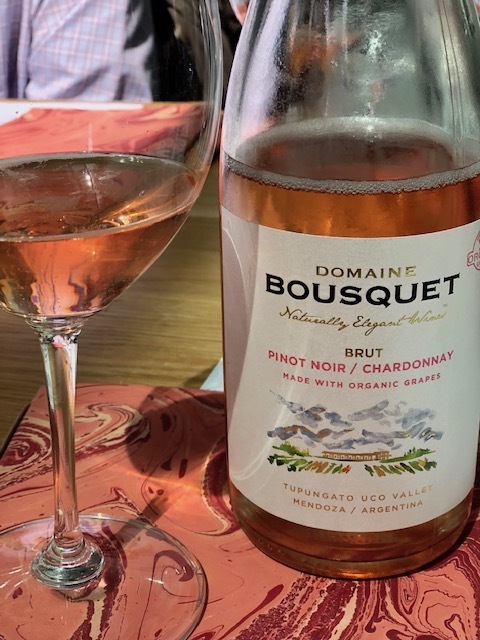 Lunch with Anne Bousquet, Managing Partner of Domaine Bousquet, is like sitting down with your accomplished friend who seems they can do just about anything, but is so incredibly down to earth you can’t help but adore her. Anne was a renowned economist for ten years in the pulp and paper industry where she spoke all over the world about the state of the market. After the birth of her daughter and with the family business of Domaine Bousquet in hyper-growth mode, she decided to join the family business. 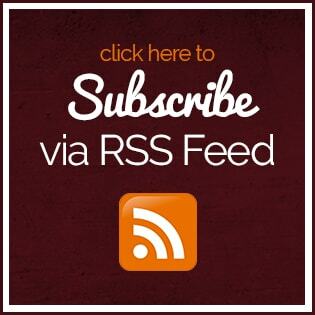 In 1990, the Bousquet Family arrived in Mendoza to research the vineyards and wineries. Her dad, Jean, first went and found the ideal location and moved from France in 1997. He planted the vines, dug a well and started Domaine Bousquet. The 110 hectares vineyard is located in the Gualtallary valley in Tupungato, Mendoza. The winery is the most awarded organic winery in the world. The Bousquet Family comes from Carcassonne in France and has a history of making wine. The goal was to bring together European wine making using the ideal conditions of Mendoza climate. 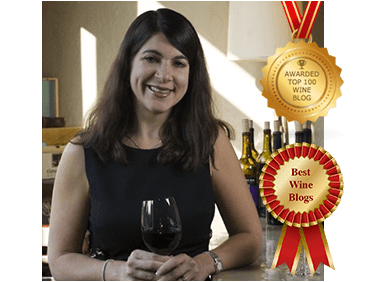 Anne toggled between her career as an Economist and helping with the family business for several years in the 2000’s while the winery was experiencing explosive growth. In 2004, she presented the family wines at a wine fair in Miami and was surprised to see the Malbec was a top winner in a blind wine tasting competition. This was the point where her husband, Labid, joined Domaine Bousquet, leaving his career of stock trading at Fidelity to sell wine. 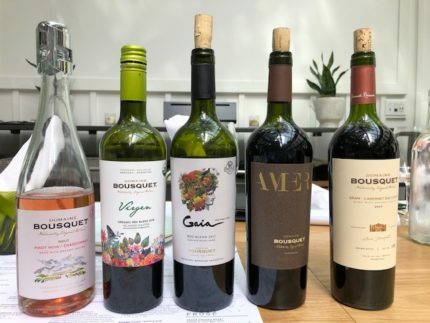 Another key turning point for the company was in 2006 when Sweden decided it wanted to expand its Argentinian portfolio but needed to fill a percentage quota for organic wines. Domaine Bouquet wines were a perfect solution and the country placed an order for 250,000 liters. 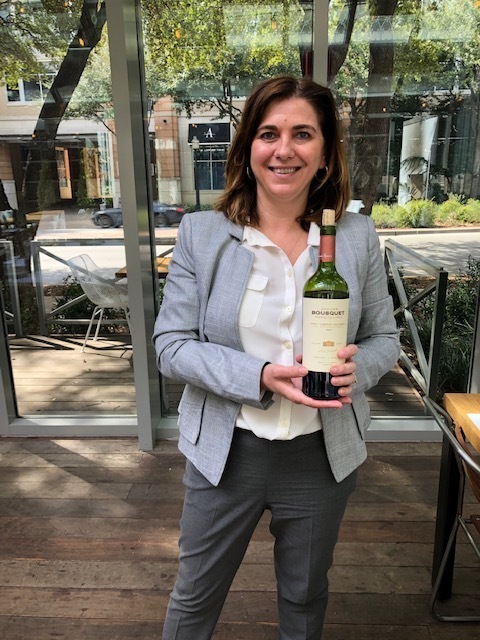 Anne talked about how she lived in Tupungato for several years, an experience she called “one of the best of her life”, but in 2015, she moved to Miami to build US sales and create an importing company for the winery. It was a pivotal move for the business, making it the only Argentinian winery with its own importing company while helping with distribution channels and costs. Viticulture and winemaking are certified organic by ARGENCERT in Argentina, which is recognized in the U.S. by USDA NOP (National Organic Program) and in the European Union by ECOSERT. NV Domaine Bousquet Sparkling Charmat Rose Brut — 25% Chardonnay, 75% Pinot Noir. Notes of strawberry, citrus and a nice minerality. This was a lovely sparkling with a $13 price. 2016 Domaine Bousquet Gaia White – This blend of 50 percent Chardonnay, 35 percent Pinot Gris and 15 percent Chardonnay has notes of stone fruit, apple, minerality and citrus. It was great with our lunch. 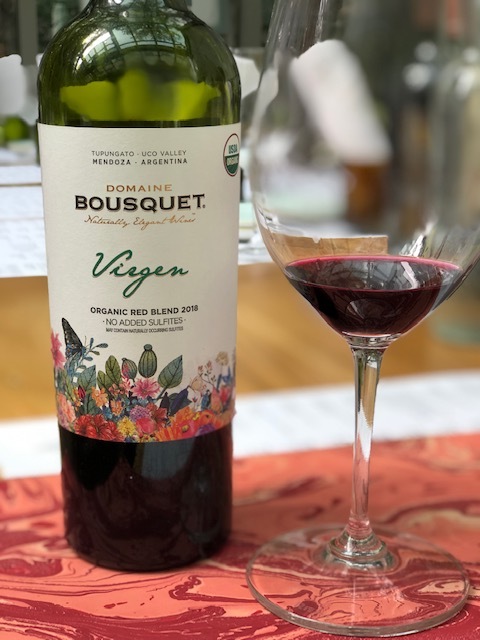 2018 Domaine Bousquet Virgen Organic Red Blend – we were the first in Dallas to try this wine with no added sulfites, which was a blend of 35% Malbec, 35% Cabernet Sauvignon and 30% Cabernet Franc. It was very fruit forward and fresh. 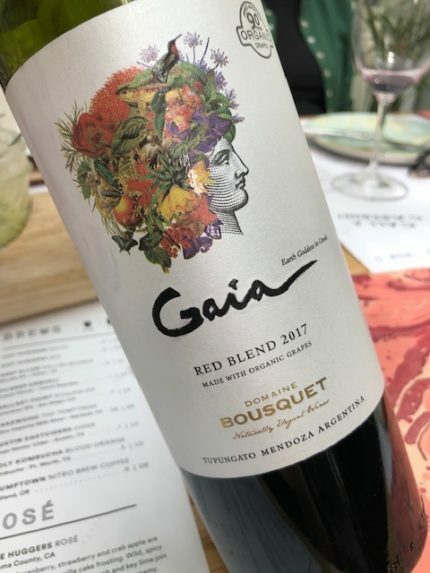 2017 Domaine Bousquet Gaia Red — This blend of 50 percent Malbec, 45 percent Syrah and 5 percent Cabernet Sauvignon had notes of blackberries, currant, spice and vanilla. Domaine Bousquet has the most vines dedicated to Syrah than anyone else in Mendoza and Anne wouldn’t have it any other way. 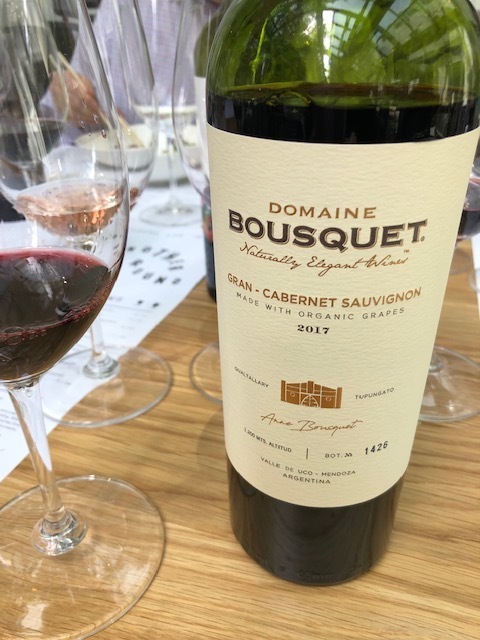 2017 Domaine Bousquet Gran Cabernet Sauvignon – Notes of blackberry, plum, floral notes, blueberries, tobacco, dried herbs and red fruit. A well-priced and elegant expressed of Cabernet. 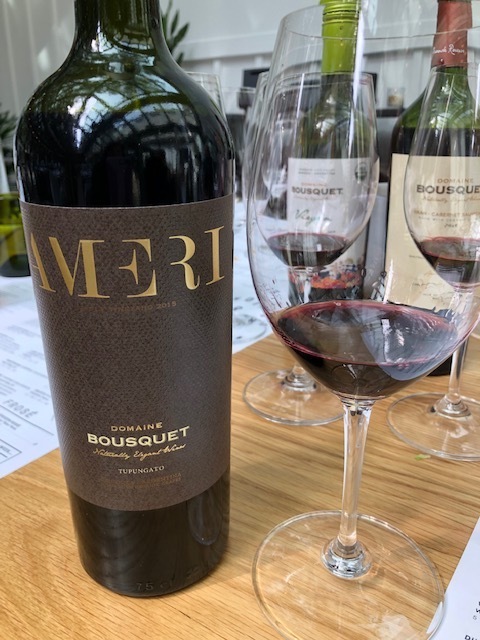 2015 Domaine Bousquet Ameri – This wine uses Labid’s last name and is the top blend of the vineyard with a blend of 65 percent Malbec, 20 percent Cabernet Sauvignon, 10 percent Syrah and 5 percent Merlot. It is a deep, pronounced and elegant wine with notes of blackberry, fig, cassis, black cherry, tobacco, mocha, earth and spice. A very special and enchanting wine. The family had an original vision to make elegant and restrained grand cru wines of Argentina at a price point that consumers could afford. Throw in the fact that these wines are organic at the same price and that is astounding…. It is lovely to meet a family with a vision that keeps in mind the earth and the consumers with wines that are so delicious.